The four chapters covering physical intelligence are Strength, Flexibility, Grace and Bearing. I think of them as the four pillars of our body’s foundation. The Zhangs, the amazing Chinese Olympic skaters profiled above, have these qualities in spades. But each of us can peak these proficiencies to our best abilities and grow this layer of intelligence. The coastal soil along this stretch of the Gulf of Mexico near Houston is reclaimed swampland: layers of wet clay, rocks and dirt. Here in the Montrose, a neighborhood near downtown, many of the old houses are built on pier-and-beam foundations. Large pillars are sunk deep into the earth and rise vertically above the ground’s surface. 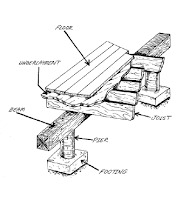 Beams are fastened horizontally to the pillars to create a stable foundation, one that can provide equal stability during long, hot summers and cold, wet winters. The house is then built on top of the pier-and-beam structure. Like the old foundations in Houston, the four pillars of Strength, Flexibility, Grace and Bearing, working in harmony, create a dynamic platform for our body’s physical, emotional, mental, moral, and spiritual health. Chapter Ten, “Strength,” covers the importance of building our muscles, followed by a discussion of conscious calisthenics in Chapter Eleven. “Flexibility,” Chapter Twelve, explains the importance of stretching and the body’s full range of motion. “Grace” in Chapter Fifteen covers our joints, balance and coordination. And Chapter Sixteen, “Bearing,” explores good posture and the natural position of our bones and how the muscles and connective tissue supports or distorts them. This chapter also explores the effects of touch and deep-tissue bodywork on this layer of intelligence.